Processing abrasive media (enriched with fillers) is a challenge for many dispensing system manufacturers. DATRON, however, has patented a special pump for this purpose, which combines high volume consistency with low operating costs and easy cleaning. The mechanical structure allows filled materials in the viscosity range from 100,000 - 1,000,000 mPas to be optimally dispensed up to a maximum grit size of 50 µm. 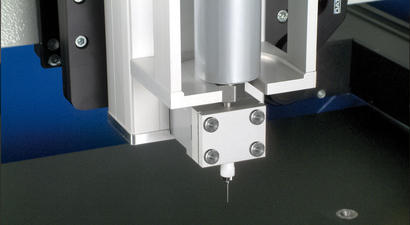 The digitally controlled iServo motor is able to position the gear wheel pump to a precision of 1/40,000 turn. This allows the smallest amounts to be dispensed in a process-reliable way. Non-linear flow properties of the material can be compensated with the software.